HomeAudio InterfacesThe Best Audio Interface for Home Recording | BAR NONE! The Best Audio Interface for Home Recording | BAR NONE! I’m back again with another article on what I like to call, the best audio interface for home recording ! You may be asking yourself: why should I care? It’s because this is the best option I have come across for noobs to home recording, to intermediates, to advanced folk. 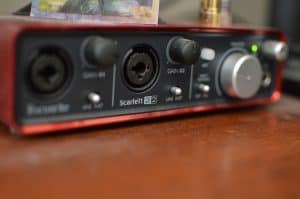 My official review of the Focusrite Scarlett 2i2! This is a really nice and affordable little unit. I have had some bad experience with interfaces in the past. I used to own the M-Audio Fast Track pro, and had a nightmare with driver issues and ease of use. I also didn’t really know why I was using it. I was a little naive back then. It scared me off of interfaces for a long time, until the day I purchased my JBL LSR 305’s, and knew I needed to bite the bullet again and purchase one. What are Studio Monitors? After much research, I kept coming back to the 2i2. It had the most reviews for this price range, and also the highest rated ones. I’m one of those people who will read reviews until I’m blue in the face, and this was no exception. I wanted to make sure I was absolutely getting the best option for my dollar. Turns out, this is probably the best and safest option period! What can I say, it was an absolute breeze to set up. Simply plug it in via USB, and WHAMMO you’re done! Haha well it’s not quite that simple, but simple enough. Just pop in the disk that comes in the box and away you go. Hooking up your mic is a breeze as well. Just plug it in via XLR, press the 48v phantom power button and you’re good to go! It has combo units for added flexibility as well. You can plug in a TS (unbalanced) instrument cable as well as an XLR cable. What is XLR? This thing looks rock solid, and encased in red aluminum. An anodized aluminum unibody chassis if you want to get technical lol. It looks great in studio, and has a nice attractive color. It also feels solid when you pick it up, and not cheap. It’s not very heavy, but heavy enough to keep your mind at ease and still remain portable. The knobs all feel great, and there are 2 that you generally need to be concerned with: The monitor and the headphone. I love the fact that they made these the most prominent feature. I can easily switch from mixing on headphones to mixing live with my studio monitors. There is a convenient headphone jack right below, just plug it in (with the 1/4″ adapter of course), and you’re listening on headphones. Just turn down the volume on the monitor so as not to bother anyone. As alluded to above, it becomes a very convenient, practical, and efficient way to do a few different things, and do them well. This will stand the test of time for you, and overall is one of the smartest purchases you will make. It’s in my opinion the best audio interface for home recording. It’s very easy to set up, quiet, and leaves a tiny footprint on your desk. It also looks great in studio and most importantly is practical and efficient. CHECK OUT MY OFFICIAL FOCUSRITE SCARLETT 2i2 REVIEW!! Thanks for reading guys! If you have any more specific questions on the best audio interface for home recording, I would be happy to answer them. Just leave a comment below or Contact me! Another great post and very helpful info if this is something you are looking for. Thank you Donna for stopping by!